Thanks to Cate & Levi for providing me with a free hand puppet to review. The Frog Hand Puppet is so adorable and it is so wonderful, because as stated, each product is different and unique in it's own way. Unlike the one pictured above, my frog had a Blue and Dark Green upward striped body/neck and the bottom part was more of a turquoise mulit-color The tounge is red :). I love that they are all a little different, because that really does make them all Unique. Nobody in the world has the same product as me! 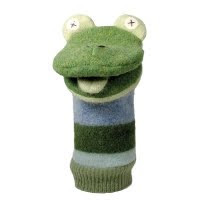 The Frog Hand Puppet is made with reclaimed wool and is 12" Tall. The Frog, plus all the other Hand Puppets are handmade and available for $35.00. The process of making all of the Cate and Levi products is environmentally responsible. "Each item is as unique as the child who adopts it." The Cate and Levi products were "born" when, while waiting on there child, the owners noticed that few products for children were One of a Kind or made responsibly. Every item is Handmade in Toronto, Canada. Every item used in the creation of a Cate and Levi product is sourced as close to them as possible (Yes! Less pollutants :)! ) And here is the thing that I love so much about the Cate and Levi products; 10% of all profits made are donated to help children in need. Way to go, giving back! 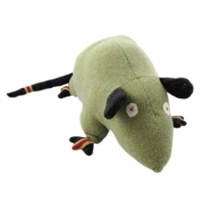 Besides the Hand Puppets, Cate and Levi also have other great products, such as..
To see how cute the Cate and Levi products are you really need to stop by and see for yourself! They have so many different animals you can choose from. Any Child would love these; I'm not even a child, but I still love them too :)!! And a quick Thank You to Josh, the owner; For giving me a chance to review the Frog Hand Puppet and to share with all my wonderful readers! Mandatory entry: Visit Cate and Levi and tell me your favorite item! Please make sure I have a way to contact you if you are chosen as the winner! The winner will have 48 hours to reply to my email, or a new winner will be drawn. The giveaway Ends June 4th, 2010 at 11:59 pm. I love the rat too...and the walrus! I love the alligator pillow pal! I love the giraffe hand puppet. i love the cat zoo cube! so so so cute! My favorite is the stuffed monkey! I visited Cate and Levi and love the Hippo and Walrus pillow pals. Love your blog by the way. Very unique! Entered the $100 Visa card giveaway. Entered the Aminals Dolls giveaway. Entered the $25 K-mart giftcard giveaway. Entered the Fantasy Jewelry Box giveaway. Entered the SmartMoms Jewelry giveaway. I love the Koala stuffed animal. The walrus wall art is super cute! My favorite is the Sheep stuffed animal. 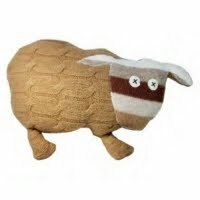 Really, really cute stuffed animals to pick from! I love the giraffe zoo cube! I love the monkey hand puppet. i like the giraff puppet. i love the dog stuffed animal!! I love the turtle stuffed animal!